Brendan Gleeson is an award-winning Irish movie star and film director, best known for his brilliant roles in blockbuster movies including Braveheart, The Guard, Harry Potter, and In Bruges, to mention a few. The actor has been active in Hollywood for over three decades and counting. Following his exceptional performances in movies, Brendan has received several awards including Golden Globe, BAFTA, Emmy, and IFTA Awards. Notably, he is the father renowned movie stars Brian Gleeson and Domhnall Gleeson. Learn more about movie veteran below. The talented actor Brendan Gleeson was born on the 29th day of March 1955 in Dublin, Ireland. He was born to Irish parents – Frank Gleeson and his wife, Pat. When he was a child, Brendan was said to be an avid reader and he completed his basic education at St. Joseph’s CBS situated in Fairview, Ireland. While there, Brendan was a part of the school’s drama group and he participated in various shows organized by the group. Soon after his graduation, Brendan first started teaching secondary school students at Catholic Belcamp College before going into fulltime acting 1991. At the early stages of his career, Brendan joined a Dublin-based theatre group called Passion Machine. Along with the group, Brendan wrote, directed, and also featured as an actor in several theatre productions during the mid-80s. Some of his popular works include Breaking Up, Home, Brownbread, The Birdtable, and The Double Bass, among others. During the ‘90s, the prolific actor starred in numerous films. He came into the limelight in 1992 following his portrayal of Michael Collins in the historical movie The Treaty. As a result of his outstanding performance, Brendan got Jacob’s Award that year. Afterward, he made several other appearances in notable movies including Gangs of New York, Cold Mountain, Kingdom of Heaven, A.I. Artificial Intelligence, The Village and Mission Impossible 2, among others. During the 2000s, Brendan Gleeson played remarkable roles in high profile and commercially successful movies. He joined the cast of Harry Potter films in 2005 portraying Alastor Moody alongside Daniel Radcliffe and Emma Watson. In 2007, he played Wiglaf in the British animated series Beowulf along with Anthony Hopkins. After that, he followed it up with an appearance in the 2008 comedy thriller In Bruges for which he got several award nominations. After playing the role of Sgt. Gerry Boyle in The Guard in 2011, Gleeson went on to make appearances in Safe House and The Raven, the next year. The prolific actor received an award for best actor at the British Independent Film Awards for his role in Calvary in 2014. He also featured in other popular movies including Edge of Tomorrow, Suffragette, Assassin’s Creed, Hampstead, Paddington 2, Psychic, and his 2019 movie Frankie. Brendan has equally starred in several TV series including the award-winning series Into the Storm where he portrayed the role of Winston Churchill alongside Robert Pugh and Janet McTeer. Since 2017, Brendan has been playing the role of Bill Hodges in the American crime drama Mr. Mercedes to date. Net Worth: How Much is Brendan Gleeson Worth? Brendan Gleeson has recorded tremendous successes since the inception of his career; all thanks to his creative mindset and exceptional acting prowess. He has made huge wealth both as an actor as well as a film director. The actor is currently enjoying a lavish lifestyle and his net worth has been estimated to be around $4 million. Check Out: Matt Czuchry Married, Wife, Age, Height, Dating, Girlfriend, Is He Gay? Brendan Gleeson has won the heart of his many fans with his outstanding performances in movies and TV series. In addition, he is equally successful in his love life. Brendan is a happily married man and a father of four children. He got hitched to his longtime partner and love of his life named Mary Gleeson in 1982. There is no much information regarding his wife, she doesn’t enjoy the glamour of the limelight despite being surrounded by popular celebrities. The couple has four children – Brian, Domhnall, Ruairi and Fergus. Two of his sons Brian and Domhnall both trailed the same path as their father. Today, they have established themselves in the British and Hollywood industries. Brendan has appeared in a good number of movies with his first son, Domhnall. Notably, the duo played an on-screen role of father and son in the popular Harry Potter films. Domhnall portrayed Bill Weasley while his father starred as Mad-Eye in the movie. The Gleeson family is so gifted with talented actors and they have all successful in their respective careers. 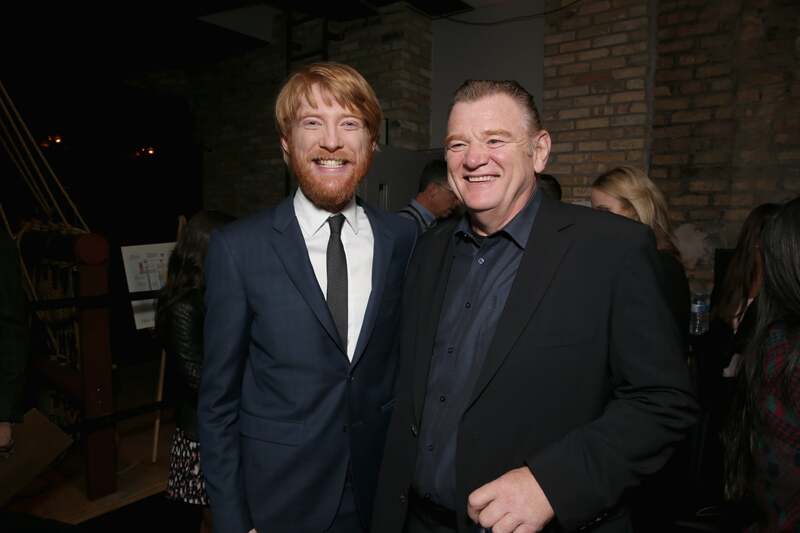 The Irish movie star Brendan Gleeson is very talented and also has an impeccable personality. He stands at a height of 6 feet 2 inches and weighs 90 kg (198 lb). In addition, Brendan also has blonde hair and blue eyes.